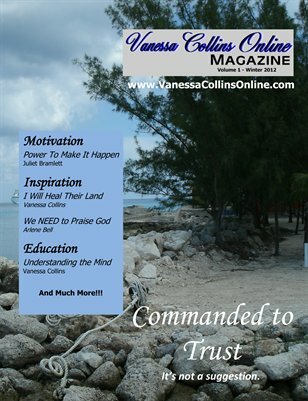 Welcome to the first edition of Vanessa Collins Online magazine. This Christian based publication is packed with articles that are truly inspirational, motivational and educational. We cover everything from praising God to how to save at the grocery store. We feature veteran writers as well as some new and upcoming talent. This edition includes: Commanded to Trust (Vanessa Collins), Power To Make It Happen (Juliet Bramlett), I Will Heal Their Land (Vanessa Collins), It Shall be Done – The Law of Agreement (Vanessa Collins), We NEED to Praise God (Arlene Bell), Understanding the Mind (Vanessa Collins), Not So Extreme Couponing (Vanessa Collins) and much more.